Maurice del Mue was born in Paris to a French mother, Ava, and a Swiss father, Santino del Mue. Santino came to California to work in the silver mines, and Maurice and his mother followed when the future artist was five years old. He grew up in San Francisco, enrolling as a student at the California School of Design as a teenager. He then spent a year in Paris, rooming with his friend, Gottardo Piazzoni, who would go on to marry his sister. Back in San Francisco, del Mue was hired as an illustrator for the San Francisco Call, while pursuing a career as an easel painter in his spare time. 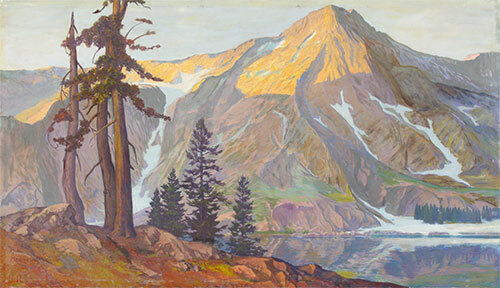 He became an active member of the vigorous art world of early twentieth-century San Francisco, becoming a founding member of the California Society of Artists and a studio-mate of Maynard Dixon.